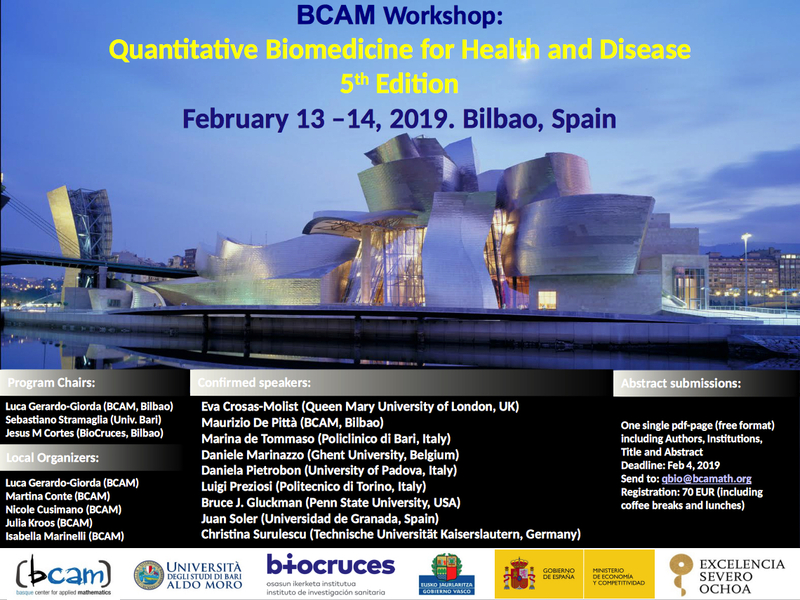 We are pleased to announce that the 5th edition of the QBIO Workshop: Quantitative Biomedicine for Health and Disease will be held at BCAM on February 13th and 14th. This event dedicated to quantitative biomedicine brings together experts and students to discuss the latest research that brings human health and its pathologies to language and methods of quantitative sciences, such as mathematics and engineering. - The capacity and limitations that arise when particular methods (i.e. modeling and simulation, network theory or image processing) are employed to different human pathologies. This year’s edition will feature a peculiar focus on cancer and neurological diseases. The workshop structure, combining high profile speakers and young talented researchers across world-leading institutions, will ensure a diverse and lively interaction between participants, helping early-career researchers to focus their interests, as discussions will have an emphasis on current approaches and outstanding questions that should be addressed in future research.